I belong to a church some would label a “Hipster Church.” I am also not a Hipster. When my previous church merged with my current church, I became an older member of one of the teams I serve on. I had lots in common with the original team, but as we merged and grew and people moved on, I became a minority of sorts. I started feeling pushed out, but not directly. I grew desperate to belong like I had before. I had no idea God was beginning to refine me in an area that had lingered since junior high. He was going to take me on a journey of realizing that putting my worth in human hands is a fickle place susceptible to Enemy tactics. It seems that the more we try to belong to a particular people group, the less we focus on who we really are. We become focused on the makeup of the people in the group. We try to imitate the style of clothes they wear and the music they listen to. We try to like what they like as if that is the sole reason any one person belongs. This slippery slope invites you to make them an idol. We need to see the signs early on. I have stumbled through this struggle for the past few years at church. I do not really fit in to the team I am passionately involved in. It bothered me that I always felt like an outsider. I was the same age as some, but in a different season of life than most. We all have a common passion which I believed would draw me closer to the group. It hasn’t and in three years I have learned a tough lesson about fitting in. It just isn’t always going to happen. This is not a reflection of them as an accepting group or on me as a person. I tried to blame the group for a while for not including me. However, this is placing a responsibility on them that is just not fair. I don’t go out of my way to include every single person who has a common interest in everything I do. The reality is that I need to fix my eyes on God and pursue his image. I need to go after deeper intimacy with the Father. I will become who I was always meant to be. If this naturally draws me to that group—great! If not, I will take the alternative, which is me being increasingly comfortable with who I truly am. Knowing who you are in Christ is the most valuable thing I have ever pursued. The confidence I exude in this endeavor draws like to like. I find myself being surrounded by all types of people. I don’t look to them for my measure of fitting in. I look to my Creator and He is pleased. So in the end, it had nothing to do with that particular group of people. It had to do with me and my ability to shift my focus and anchor my worth to the right thing. I can hang with this group now and feel good in my own skin. 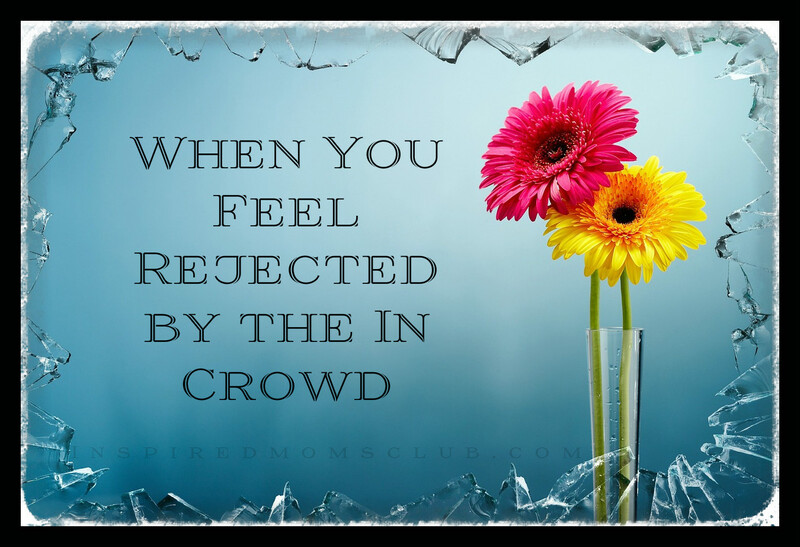 Most of the time our own feelings of rejection are rooted in our shaky self-confidence. This is not a shame thing. Please don’t hear this as defeating—there is hope! We all can fall prey to this tactic of the Enemy, but the silver lining is that we have the power to overcome this trial. When you feel rejected take some time to self-evaluate. Ask the Holy Spirit if there is a lie you are believing about the group/person involved. Seek to see how much responsibility you are placing on the other party for the way you are feeling. I tend to put a lot of weight on the other party to make me feel a certain way. The reality is that you control this more than you probably imagine. I can’t stress enough how much pursuing intimacy with the Father will change you from the inside out. It will give you the greatest sense of self-worth! The outpouring of this is that rejection loses some of its sting. Jesus himself was rejected by many and He can minister to your heart on this subject better than anyone. He along with Holy Spirit will help you weed out the Enemy’s lies about the situation. The Enemy inflates the rejection and tries to make it personal. Our Advocate—Holy Spirit—will sift out the lies and give you dominion over them. This allows you to see the situation more clearly. Father, I lift up all those who are feeling the sting of rejection today. I know the hurt and the susceptibility we have to take it personally. We may not know why the other has rejected us, but I pray for clarity as we evaluate each situation. I pray for confidence in who we are in you. I ask for supernatural revelation to each heart seeking to overcome their hurt. I know you come alongside us all when we ask. Thank you for being the author and perfecter of our faith. In Jesus’ name I pray, amen.